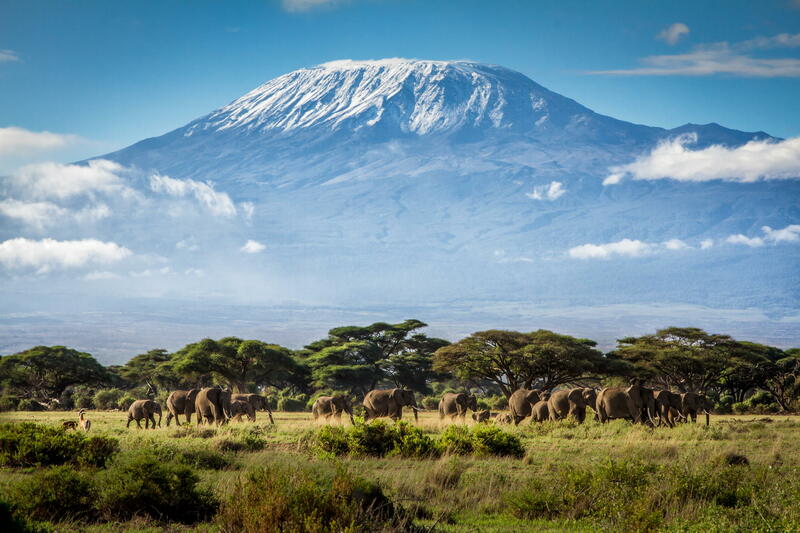 It’s 11:00 pm Friday, September 25 and many of you (my friends in New England at least) might be thinking about bed time when you think to check in on our Kilimanjaro Team some 7 hours ahead of you. For us, we most likely began our summit attempt at midnight and are closing in on the prize! We are breathing air so thin in oxygen that each step requires a breath of its own to allow our muscles the energy to lift onto the rim of Kibo’s Crater and hopefully Uhuru summit! For us the sun is just about to rise, casting a brilliant splendor across a landscape too few may ever appreciate. Can you imagine the swirl of emotions overwhelming each of us on this expedition at that moment? Some speculate that the very name of Kilimanjaro is a European pronunciation for the KiChagga phrase meaning “We failed to climb it!” Others suggest it is loosely derived from a blend of two words in Swahili and KiChagga meaning “Mountain of Whiteness.” Its legendary arctic and glacial top is steadily melting though we can expect conditions not too dissimilar from our own White Mountains in winter. I’d like to think you’ll have the chance to read our celebration message from the summit before you retire for the evening, perhaps sharing a bit in our own celebration of achievement at such an epic quest. Perhaps you’ll have been following along throughout the entire week. Monday, September 21, we pass through the Machame gate and trek through the rainforest on our way to Machame camp. We have selected one of the most scenic routes rather than the most easy of routes. You’d expect different for a team with a somewhat determined blind man? Remember how wonderfully the new scents and sounds will be received by me. Also realize how very fortunate I am to be surrounded by a team of friends who will likely share their various visual observations to enhance my experience still further. Departing the rain forest and traversing a ridgeline with heather towering at thirty feet in some places, we enter a river gorge and work our way up to the Shira campsite. Reaching an elevation of 12,500 feet for the evening we’ll have our first real taste of the impact of thinning air. 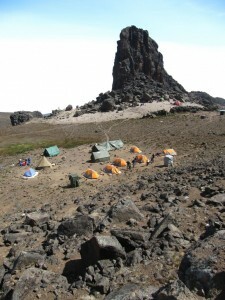 Hikers camping near the Lava Tower at Kilimanjaro. We spend the morning climbing up through mostly desert conditions to the Lava Tower where an optional lunch-time diversion would enable us to climb this prominent feature along the Arrow Glacier. We then descent to Barranco camp back at our original elevations though further along our route. This is a day which helps acclimatize us all to the impending high elevations ahead. Our distances are getting shorter as we hike along the Great Barranco Wall, via steep ridges before descending to the Karanga valley camp. We are now in alpine desert and continuing the preparations for our acclimatization to the extreme elevation. We’ll learn the word “Polle!” hear as going “slowly” is the key to manage the challenges of exertion at elevation. 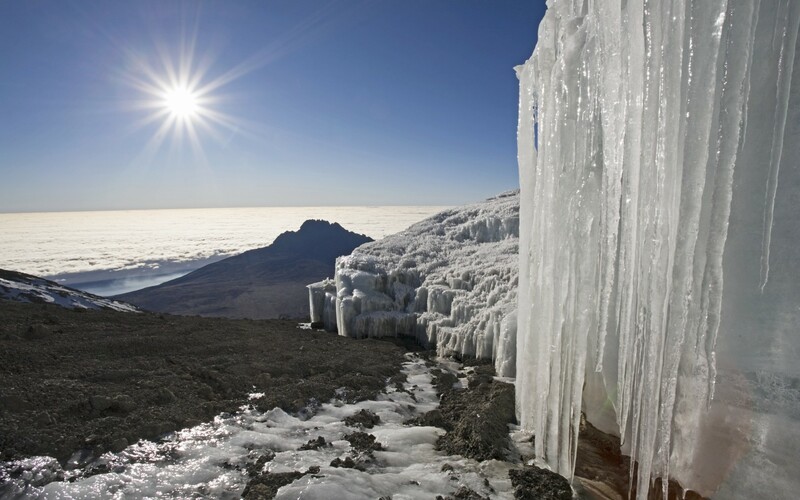 Our shortest day will take us to Barafu Camp and the completion of the south circuit which will provide tremendous views of the multiple summits of this three volcano mountain. At just over 15,000 feet of elevation we mentally and physically prepare for the hardest challenges of the expedition on our summit day. We’ll be to bed early as the hiking starts at midnight. 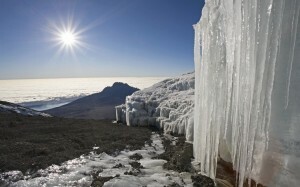 Ice at the Kilimanjaro summit. Midnights starts our trek between a pair of glaciers to the base of the summit cone. A strenuous scree-laden hike up the steep volcanic cone will challenge us as we rise into the arctic zone to the crater rim at Stella Point. At 18,600 feet we will earn a brief rest and begin the window of sunrise that will rival the actual summit for majestic grandeur. Proceeding ever so slowly along the rim we will reach Uhuru Peak at 19,343 feet and be on the highest point on the continent of Africa. Celebrations will be incredible but a long descent still remains down the steep, scree slide of the cone and all the way to Mweka Hut camp at 10,000 feet. Our lungs will delight in the oxygen riches of that elevation as our weary bodies take to slumber on our final day on the mountain.